Both days the Y is closed. If you get a uni over the holidays, you can show it off January 7th, 2012. It's also a good time to kick off those New Year's resolutions. 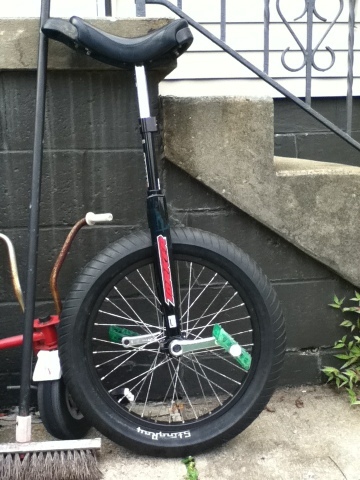 Unicycle yourself into better shape! Phew, alot of information - all about the different uni disciplines. The Butler Wobble - that’s what we call ourselves - will be attending again in 2012. Nationals in 2012 will be July 10-15 in Saline, MI. Saline’s only 4 ½ hours away! Mark you calendars now! Beginners are welcome in all events. There are age groups for everyone. Because UNICON (World’s) is also in the summer of 2012, this year’s Nationals may be less heavily attended - which will be great for new riders! There is a registration fee for competiiors. It’s not too expensive, usually around $100. So, since we are able to meet at the Y free, start saving now by setting aside a few dollars each week you attend at the Y as your “fee” and you’ll have saved up much of the Nationals entry fee! Also, you are required to be a Unicycling Society of America (USA) member to participate in Nationals. We don’t ask that you join USA to participate at the Y. However, when the Wobble participates in parades or MUni events we ask that those participating be USA members because one of the benefits of USA Membership is insurance for the club as a group, and for the individuals who are participating as part of that group. Membership is $20/individual or $35/family (all members at the same address). See http://uniusa.org/membership/ for more information. When you do join USA, please let us know so that we can update The Wobble Roster. A Crit is a short circuit course, often a small city block where the racers complete a set number of laps. There are often standard and unlimited heats as well as age and gender classes. It’s a fast race, because the course is short, and is very spectator friendly. The 10K often has both standard and unlimited class as well. It’s often part road, part park, part bike path. Again, it depends on the host city’s available accommodations. A marathon is 42K (26.2 mi) and often is only offered for the unlimited class. It is often, mostly, a road race. Skill Levels are a set of skills that are grouped and ranked so as to allow for levels. A rider must test at a lower level before progressing to a higher level. Testing is done by a certified Skills Tester and there are times set aside at Nationals just for testing for your level. There has been some discussion about altering and updating the skills, but for now, these are the accepted levels. There are also the Hutch or Trials levels. The Trials levels were developed to incorporated more skills related to Street/ Flatland/ Trials and MUni riders. There is some overlap, but the two systems are not interchangeable and the Hutch Levels are not officially recognized. What a perfect day to ride a uni. Reminder: No Y time tomorrow. Unfortunately, a regular basketball tournament has the gym. Now, if it were a unicycle basketball tournament, that would be awesome. Next Saturday we're at the Y again. Also, thanks to the 9 new learners who showed up last week! This Saturday, November 12th, there will be a basketball tournament at the Y so the gyms will be closed. There will be NO UNICYCLING CLUB! We're looking forward to seeing everyone again on the 19th from 4:30-6:60pm. Last week we had a great turn out and are looking forward to the possibilities this year! If you're still on the fence about learning - come out and watch! Riding's a ton of fun. If you're on Facebook - look up the Butler Wobble and request to join the group. It's a great, quick way to stay in touch and find out what we're up to. Brady's Run! Month of Mud is ONNNN! Dave, Isaac, and I just finished up our first race of the Month of Mud season. I'll admit that I was dreading the task, having been a bit of a slacker, missing many opportunities to ride this year. Dave says the better shape you're in, the more fun cycling is. Fortunately, unicycling is a fun way to get into shape. I don't know anyone that regrets going out for a ride once they get out there. The thing about Month of Mud is that it is a great atmosphere for anyone who wants to challenge themselves. Mountain bikers are always welcoming to new riders, and are especially impressed by anyone on a uni. Brady's run itself is a tough course with plenty of extended climbs, which is why Isaac and I have avoided it in the past. We enjoyed most of the race riding neck and neck, passing each other only when one of us would get hung up on on a root. Its been good to see how much Isaac has improved over the last year. He certainly gave me a run for my money. I think if he'd had the same size wheel as me, it would have been a whole different race. I'm looking forward to seeing how the rest of the season unfolds. Oct 2nd is the Cyclocross race at North Park. It should be the perfect course for beginners and for spectators. Hope to see y'all there! There has been some discussion as to what we've been up to lately. We've been playing outside. You're welcome to join us. Thursday evenings, around 6:30-7pm, we've been spotted at Ritz Park in Butler. The park has tennis courts and a basketball court that we use for practicing skills. We use the grass, gravel road and small trail for beginner off road practice. It's a good little park to practice uphill and downhill and mixed terrain. Especially for the beginner who wants to try all those things but is intimidated by the traffic on the road or the difficulty of you standard mountain bike trail. On that note, if you are a beginner and working on any new skill, don't be intimidated by our skills...we love watching and helping others learn new skills. We are always willing to lend a shoulder or arm (It's called "being a post" or just "post") - should free mounting be what's holding you back from practicing other skills. BTW, the tennis courts are a great place to practice free mounting. On Friday nights we join the Butler Bicycles and Unicycles Friday Night Group Ride. It meets at 6pm in the parking lot on Main St. across from Pizza Joe's & Flynn's Tires. The bicyclists follow the approved bike routes through town. 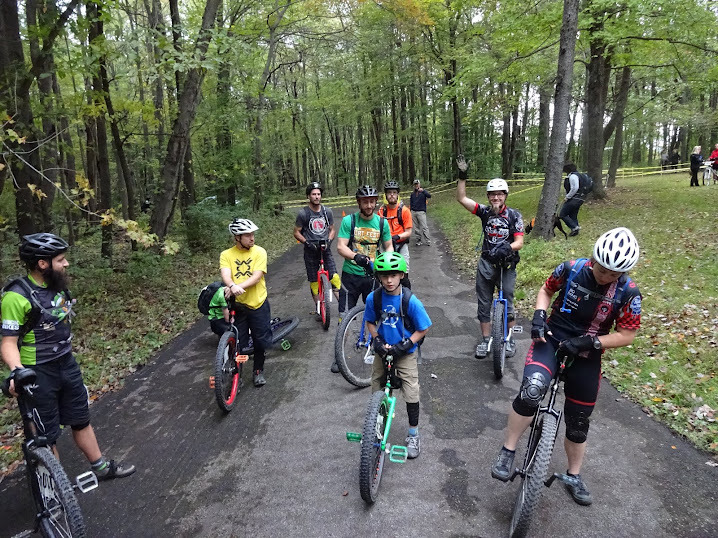 The Unicyclists take a different route, to use a few less traveled roads and practice hills. We also do a few laps at Memorial Park. This is a great way to learn road uni riding, while not being on the main roads. Again, beginners are welcome. If free mounting or fear of road riding are holding you back from joining us, please put those aside and join us! We are always willing to offer a shoulder and be a post to get you started. No matter how many times you UPD (Un-planned dismount). We frequently try the same section of road over and over again, taking turns, just to figure out how to get up the hill, over the pot-hole or past a section of bricks. If you'd like to join us for either ride, please remember that helmets are strongly recommended - as they are mandatory for our inside rides and outdoor competitions it just makes sense to wear them any time you ride. Isaac makes it look easy. Rick has only been riding since last winter! He's be become quite the climber and uses his uni a lot. Yes, we were allowed to ride around the car show! We had 6 in the Uni Class (an off road record for at least Western PA!). In the pic are: Claude, Isaac, Andy, Connor, Dave, and Buzz. 7.78 mi of good racing times. Look for a race writeup (including some uni info) in the Pittsburgh Post-Gazette this coming Saturday (the 25th). Thanks Shannon in advance for the article! You might not recognize Claude, Connor, or Buzz. They aren't from around here. Claude made the trip from Germantown, MD; Connor from near Erie, PA; and Buzz from Rochester, NY. Good times. On the horizon: more goodness. July 4th we'll be joining Chas from Pro Bikes for the Monroeville 4th of July Parade. Also joining us will be a bunch of kids on bikes. Human Power! July 9th we'll be in Emlenton for a parade. The parade is at 6pm and Emlenton is a bit far to ride a uni to and make it home before dark so we'll carpool. Meet at Darn Yarn Needles and Thread (371 N Main St. in Butler) at 4:15 if you want in. We need to be there by 5pm. If you're meeting us in Emlenton, we'll be at the Post Office. July 23-30th some of us will be at the annual North American Unicycling Convention and Championships in Madison, WI (this year). Lisa, Dave, and Isaac are competitors this year. Last Saturday was the Butler-Freeport Trail ride. Andy and Dave rode 36ers. Nate, Issac, and Brent rode bikes. 40+ miles of good times with a pizza stop in the middle and a Slurpee stop at the end. This next weekend (11th-12th): Muni. Saturday will probably be very local and Sunday we'll look to head out for a drive to the start. Also, we may be at Mazzanti's Beans and Cream for the car cruise/ Autism benefit on Saturday afternoon. Want to join us? First item of business, ride. You will be able to find us all over the region in June. June 4th we will be joining with our biking brethren for the inaugural Butler-Freeport rail trail ride. Although this won't be the first time it's been ridden, it will be the first time the trail is DONE! 45 miles of goodness round trip. You don't have to do the whole thing, but if you want to- pack a 36er (or Schlumpf) and we'll start from Butler at 9am. We'll do the downtown ride the night before (6pm) if anyone wants to make a weekend of it. We were originally going to muni all over that weekend, but the rail trail ride is too important. We can still ride on Sunday this weekend, but it will be a bit less formal than the next bit. MUni weekend has moved to the 10th-12th. Muni, polo, maybe some trials. More details to follow. You won't want to miss it! The 18th is the Fat Tire Challenge in Brookville, PA. Check the entry form- there's a UNI CLASS!!! Lots of riding is coming. You've got the rest of the month of May to get in shape. Do You Ever Leave the Gym? The First Butler Wobble Group Muni Ride of the Spring Season. Saturday the 26th of March dawned with a beautiful clear sky and crisp cool air as 5 of the Butler Wobble's more skilled and adventurous riders converged on the Butler Little Theater parking lot to start the first group Muni ride of the spring season. As the first couple of riders arrived we occupied ourselves in small talk and playing at small street and trials skills rendered more difficult with the larger Muni wheels. As the last of our group arrived and we were preparing to ride out to take on the trails, someone noticed that Tony's tire was off bead. This was when the tone of the day was really set, instantly everyone was offering tire levers, and pumps, and friendly ribbing. With the help of Nate's enormous pump the problem was soon rectified and we were off to start the day by climbing Ritz Park on the way to the trails above Memorial Park. We frequently ride the trails above Memorial Park, however trail conditions were rendered particularly interesting at the beginning of this ride. The cold had frozen the saturated soil and had pushed ice up out of the ground giving it a very unique texture. At one point we had a rather amusing group UPD, two members of our group fell almost simultaneously, resulting in a domino effect causing every member of the group to have fallen off at the same time. On our second loop through the trails one of the brothers Manfred spotted a couple of logs next to a fire pit and suggested that they would be fun to jump on. We stopped and those of the group with adequate skill and courage took turns jumping on to and across the logs while the others offered encouragement, suggestions, and some friendly ribbing. Once we exhausted the possibilities of the fire pit area we decided to move on to the Memorial Park hills, and Lower Alameda. The first hill down to Memorial Park is deceptively challenging. It is short, but steep, rutted, and leaf filled. Again with this small challenge a deep sense of camaraderie prevailed as each of us took as many tries at the hill as we felt we needed to accomplish it to our personal satisfaction. The second downhill into the park is much more intimidating, and used to be a source of much trepidation as a beginner Muni rider. This ride it seemed almost anti-climactic. It is very clear, from small aspects of the ride like this one that all of us have improved significantly from last year. As we cut down into the park proper several kids and parents at ball practice called out in surprise and admiration at the site of unicyclists riding over the hill. At this point one of the big advantages of group riding was clearly evident as one of the group members took a great line that no one else saw, jumping off of the road bed, on to a small bank and riding it out. This was a particularly fun line as it was accessible to every member of the group with a few tries and encouragement. For the next stage of our ride, we moved to the service road at the back of Lower Alameda Park. From the beginning it was clear that this stage of our ride would be a bit of an adventure. Apparently loggers had been in to ply their trade in some regard, perhaps to 'clean up' trees downed by the soggy winter and heavy winds. The dirt roads were torn and rutted and tree tops frequently protruded into the trail. This might seem like a big disappointment, however the ruts and mud made an otherwise uninteresting ride on a dirt road into a much more technical and physical challenge somewhat reminiscent in parts of the Grove City race in the local Month of Mud racing series. One unexpected disappointment resulting from the logging action was that a rather technical cross trail that we enjoy was impassably choked with downed tree tops, forcing us to bushwhack our way back to the main road. Shortly after regaining the main road Andy spotted a new source of challenge and amusement, a couple of large logs stacked against the bank along the edge of the road. As a group we stopped to work out how to make Andy's suggested challenge of jumping off the bank onto the logs and then jumping down to the road workable. With some group collaboration and Dave and Andy's skilled experimentation with different approaches the challenge was overcome and an additional challenge of riding the logs as a skinny was taken and achieved. This was the last major Muni challenge for the day and the ride back along the paved park road was a nice cool down before heading off to encourage some new riders at uni club to refine their skills so they can join us in future Muni mayhem. I hope you read all of Isaac's report. YouTube is ok, but the written word is better. Yeah, you should join us. Unicycling is AWESOME! We're still practicing at the Y on Saturdays from 4:30-6:30pm. There's no better time to learn than now. It looks like the weather will be taking a turn for the better and soon we'll be hitting up Father Marinaro skatepark to ride Western PA's only public (and free to boot!) uni trials course. We'll post when that definitely happens, but you'll want to be ready. If you've been wanting to join us to learn unicycling, the time is now. When attendance drops off at the Y towards the end of April we'll put Saturdays on hold until the Fall. Don't miss out! -Especially since Polo season is coming. We've heard it's been said that 10 hours is the average time it takes to learn to ride a unicycle, but we've found with this crew it's been a lot less. It seems that having others around who are working towards the same goal has accelerated the learning process. About half the riders in the video are at the 6 hour mark or less. Join us at the Butler Y on Saturdays through April. 4:30-6:30pm. Sign a waiver and wear a helmet. We have extra loaner unis if you need one for the day! Another (relatively) quick video on unicycling basics. This time it's about choosing a unicycle. There's a lot more information out there on the topic, and as always, come join us for a ride and we can talk shop! Yes, we will be riding this Saturday since we haven't been invited to perform at halftime during Sunday's Superbowl. Here's the first in a series of (somewhat) instructional videos. They'll all be free. You'll get a little more than you pay for. Upon review, there were a lot of details left out. The big idea we went for is that falling off a unicycle won't (most likely) kill you. Catch up with us Saturdays at the Y.